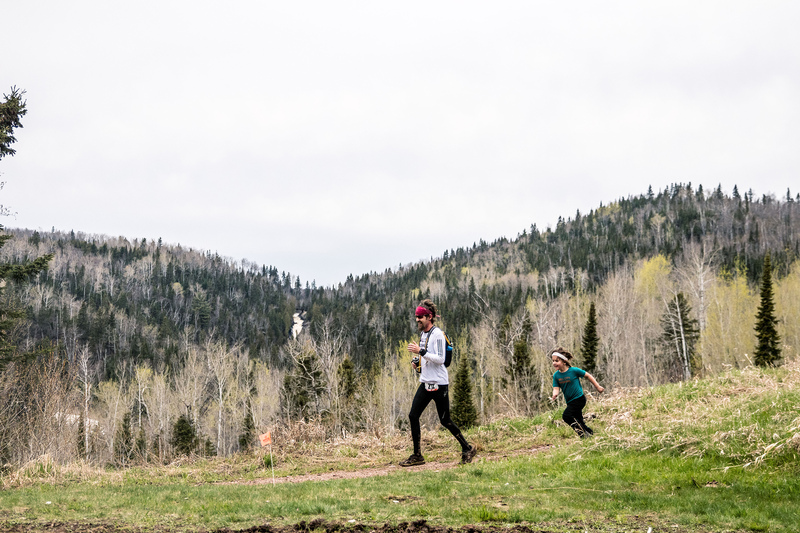 Welcome to the sixteenth running of the Spring version of the Superior Trail Race. The Spring race was started in 2003 by Minnesota Dog Pack Ultrarunning Club legend Rick Lindquist who just so happens to come from the same kennel as current RD John Storkamp. Spring Superior was my first trail race. I knew one other person running it that year—Tom Weigt, who I started and finished with, although I didn’t run any middle miles with him (he ran smarter than me, something neither of us are known for). The next year Spring Superior was my first ultra. I have as much or more fun volunteering it, which I’m doing this year, as I do running it. It’s a race full of memories, and friends that feel like family, and it’s run on my favorite playground. I hope you’re as excited about it as I am. This year’s running is in memoriam of Jon Mathson, a father, husband and friend to many, who passed away at age 41 from cardiac arrest during last year’s race. Jon was a three-time finisher of the Superior 25KM race, loved trail running and mountain biking with friends, and was an avid birder. Jon taught Earth Science and Chemistry at Eagan High School and was revered by his students and co-workers alike. Jon is survived by his wife, Becky, and son, Dylan. May we use this year’s race as an opportunity to consider Jon’s zeal for life, his energy and love. May we remember the hole his memory and absence leaves his friends and family and support their grief and share their joys. May we consider the efforts of the volunteers, medical workers, and other runners who worked to save him. May we use his memory and passing as a reminder to love without restraint and to live, run, share, and love today with all we have, remembering there are no guarantees of tomorrow. Overall race stats: Registered Total 926, 451 men (49%), 475 women (51%), 23 states and 3 Canadian provinces represented. Youngest runner: Sonya Shyrshova, 8 years old. Oldest runner is Burgess Eberhardt, 76 years old. Average age is 39 years old. 50k Race stats: 291 registered runners, 193 men (66%), 98 women (34%), 15 states and 2 Canadian provinces represented. Youngest runner: Luther Knudsen 19 years old. Oldest runner: Harry Sloan, 69 years old (Harry is the founder of the Superior 100! ), Average age is 38 years old. Men’s race: Last year’s Superior 50k winner and course record holder Ben Cogger, who has 3 of the fastest ten results of this race, will be facing last year’s Superior 100 mile winner, Neil Collick, who came within a minute of that course record. What a match! But if these guys misstep, there’s a deep and fast field behind them, including Dimitri Drekonja, six-time finisher and volunteer race doc who should be running high on volunteer karma) Canadian Steve Graupner, who seems to keep getting stronger and stronger with each outing, and Nick Melnyk, among others. Women’s race: This may be the deepest field of all the races. Thea Fleming has several past wins at the 25k trail distance and is a sub 3 hour marathoner – she is a serious vet of both the road and trail scenes. Heidi Skildum has placed first and third at the Superior 25k. Rochelle Wirth, even as a Grand Master, could be the one to emerge—she has an incredible pedigree of wins at Eugene Curnow and Voyageur and quite the history with the Superior races. Jayna Tomalty won this race last year and is rarely out of the top 5. Laura Albares is another previous winner (2016). Margaret Ho and Kristen Rognerud will both be threats as well both having raced well at Superior in the past. This race exemplifies its namesake as the deepest lake you’ll ever see! Other fun stuff: Maria Barton has the most Superior 50k finishes with 10 and will be going for number 11. Steve Hegedorn is attempting number 10. Rick Bothwell and Zach Pierce are shooting for their 9th finishes. Current 50k course record holder (4:30:32, 2017) Emily Gordon (now Tholen) will be volunteering at Oberg this year, because that is how real-deal runners roll around here – they give back. 25k race stats: 361 registered runners, 169 men (47%), 192 women (53%), 12states and 2 Canadian provinces represented. Youngest runner is 12 year old Graeme Pearson; Oldest runner is 66 year old Loren Albin, Average age 41. Men’s race: Chase Nowak wins races. His Ultrasignup page shows nothing less than a second place finish in all his races. The dude’s got wicked speed. Funny thing is, Michael Borst is darn good at winning races too, lots of them, and he’s won and set records at most major trail ultras in the state and Upper Midwest. He’s been running some deep and big races around the world too (UTMB CCC, Chuckanut) and even though he’s young, he’s experienced and he likes to run without fear and he likes this course. It will be interesting to see what these two do to each other. James Sorenson was second to Borst in the 2017 Moose Mountain Marathon and he ran and won his first Superior 25k in 2009 and also won it in 2012 – like Mike and Chase, he runs to win. Luke Nelson and Adam Schwartz-Lowe will duke it out for the Masters title. Women’s race. Tiffany Kari won the Superior 50k in 2015. Cassie Pratt ran a 1:55 at the Afton Trail Run last year for third place, but that time is the 11th fastest at Afton, which at Afton says something, those race fields run deep. Anna Lahti likes to run well here and has lots of experience on this course (2nd in 2017, 4th in 2016, 2nd in 2015, 4th in 2013, 4th in 2012), damn! Katlyn Stout has a similar string of 2nd, 3rd, and 4th place finishes here, damn again! Other fun stuff: Loren Albin who just biked across the country, is going for his 10th finish. He just celebrated an anniversary with his wife Pam, who is looking for her 9th finish – if you happen to see either of these folks and have never met them, you should introduce yourself, they have been running MN trails and ultras since many of you were in diapers! 12.5k race stats: 274 registered runner, 89 men (32%), 185 women (68%), 10 states 10 and 2 Canadian provinces represented. Youngest runner is 8 year old Sonya Shyrshova, and Oldest runner is Burgess Eberhardt at 76 years old. Average age 38. Men’s Race: Current Superior 100 Mile course record holder Jake Hegge is registered although he is rumored to be volunteering with the timing crew as well – he’s fast enough that he can probably do both. Previous Superior 100 Mile course record holder and current Moose Mountain Marathon record holder Wynn Davis is running. Last year I wrote about being excited to see this showdown in the fall 50, but it didn’t happen. Now my wait is over. Women’s race: This one’s wide open. No entries stand out as clear favorites. Courtney Schwind has some good experience, but Kerrie Berg, Robyn Schlangen, Anya Scheibmayer, or Sarah Ambroziak could all do well. Other fun stuff: John Storkamp’s been chewing on this race for some time, wanting to make it happen, especially seeing how the race’s growth has limited the amount of people who want to participate. A couple years ago he and I were running around Moose Mountain the day before the race when he mentioned a couple course possibilities, and this one is an obvious beauty, with some of my favorite parts of the Superior Hiking Trail shoved into a short amount of miles, including Cathedral of the Pines Camp (who we are grateful to for helping make this race happen), Lake Agnes, a section of the Poplar River that those who are used to crossing the bridge near the finish aren’t used to, and the stunning overlooks of the Lutsen Scientific and Natural Area. This race will also be good prep for those looking to bump up to the 25K in the future in that it is backcountry running and there is no aid station, so just like in the 25K, you have to be able to carry your stuff and go without aid for 7.75 miles. Enjoy the inaugural running. I’ll be up shooting pictures and helping out in other areas this year. As RD John does, I would also issue the following challenge – go out of your way to meet some new people this weekend, this is what sets our community and the Superior Trail Races apart, we know eachother as friends and as the years pass, we start to feel like family. See you there! Kevin Langton writes frequently for Rocksteady Running and wrote ‘Superior’, about the Superior Endurance Run (https://www.amazon.com/Superior-Endurance-Americas-Gnarliest-Ultramarathons/dp/153022862X).